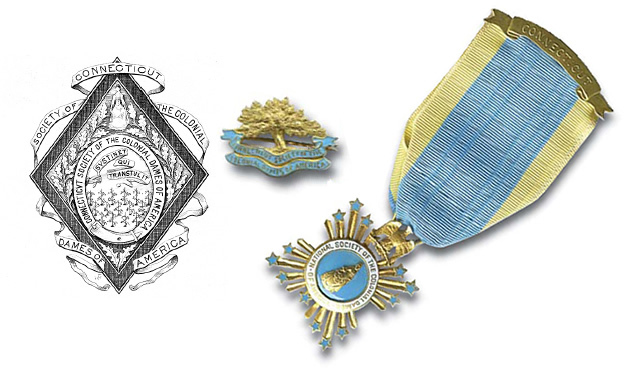 In 1893, one year after the National Society of Colonial Dames of America was formed in Philadelphia, Elizabeth Colt, Hammersley, Evelyn Salisbury and Mary Hoppin met at Elizabeth Colt’s home, Armsmear, to establish the Connecticut Society. Elizabeth Colt served as the Connecticut’s first president from 1893 to 1896. She served as National’s Vice- President from 1900 until her death in 1905. As a genealogical based organization, the Connecticut Society was naturally interested in collecting and preserving vital records, many of which were threatened by moisture and mildew in church basements. The Manuscript Committee arranged for the originals or photostatic copies to be kept at the State Library in Hartford. The Connecticut Society formed a committee to prepare an inventory of 18th century portraits, and another to organize an exhibition of 18th century silver, but its greatest contribution was and continues to be in the realm of historic preservation. Between 1897 and 1904, the Society led the effort to save the Henry Whitfield House in Guilford. Between 1910 and 1921, it was active in the effort to preserve the Old State House in Hartford. In 1919, the Connecticut Dames assumed the responsibility of preserving and interpreting their own historic property with the purchase of the Joseph Webb House in Wethersfield. Between 1915 and 1935, the Connecticut Society’s Committee on Old Houses documented over 1000 of the surviving 18th century houses in the state. The professional survey form required a title search, measurements, materials and floor plans. The Committee commissioned architect J. Frederick Kelly to prepare many of the architectural plans and elevations for the Society’s publications. Mr. Kelly later used the drawings in his own book, Domestic Architecture of Connecticut, published in 1927 and still an important reference on 18th century houses in Connecticut. The Committee on Old Houses expanded the scope of their project to include early 19th century examples, many of which had been built to serve as inns along the post roads that linked the towns, cities and states of the new nation. The Society donated leather-bound copies of the research to the State Library. Today, the NSCDA-CT is the proud owner of the Webb-Deane-Stevens Museum, considered by many to be “the jewel in the crown of Connecticut’s historic house museums.” The Museum’s three 18th century houses sit on their original sites in the center of Wethersfield’s Historic District and include two National Historic Landmarks: the 1752 Joseph Webb House and the 1769 Silas Deane House, as well as the 1789 Isaac Stevens House, which is listed on the National Register of Historic Places. The Museum has been accredited by the American Association of Museums since 1974 and is widely recognized for the quality of its interpretation and guided tours as well as its school and public education programs. 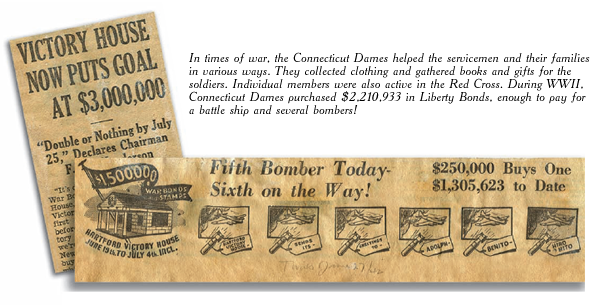 Today’s NSCDA-CT members are following in the footsteps of all the “Dames” who came before them. They are providing the vision, leadership and resources necessary to both properly care for the houses and plan and prepare for the future.